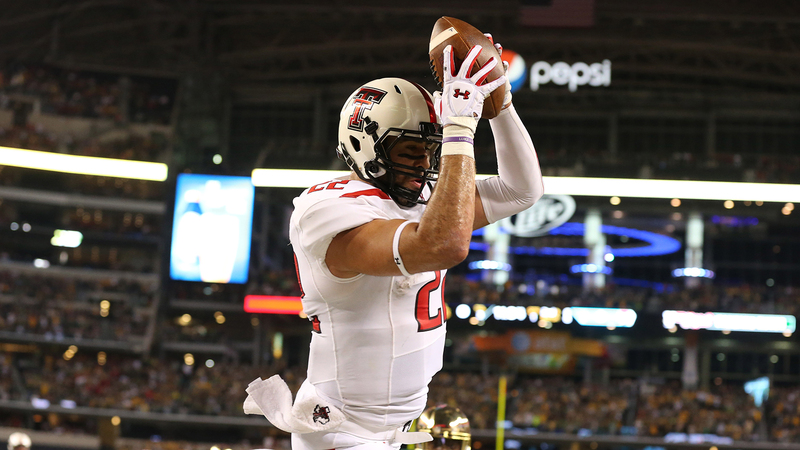 Texas Tech tight end Jace Amaro will forego his senior season and enter the NFL Draft. Amaro announced his plans after the Red Raiders’ 37-23 win over Arizona State in the Holiday Bowl on Monday. "I felt like it was the best decision for me personally and it took a lot of time and if it was about money or anything else, I wouldn’t have been debating it for so long and it was a hard decision because I love these guys and they mean the world to me and of course, I want to come back," Amaro said, "but, yeah, at the same time it’s too big of an opportunity to pass up." Amaro led the Big 12 with 106 catches for 1,352 yards and seven touchdowns this season. His 1,352 yards were an NCAA record for a tight end. He caught eight passes for 112 yards in the win over Arizona State. "I feel like I did a great job this year and I know what I can do next year. I can improve on a lot of things but for my sake I feel like it’s my time to go and thank you for everything Texas Tech has done for me and my family and it’s hard to imagine that I’ll never play at the Jones again and running out of that tunnel," Amaro said. "Right now I can’t believe it’s all over for me. I thank God for every single moment I’ve had." Amaro had six games with more than 100 yards receiving this season and is expected to be one of the first tight ends drafted in the 2014 NFL Draft. Amaro was not a finalist for the Mackey Award as the nation’s top tight end, but the omission was considered the biggest snub of the college football award season.